Description : A small compact wallet to snug into your pocket. It is also made in the Tamponato and is shut by a tab and dome system. 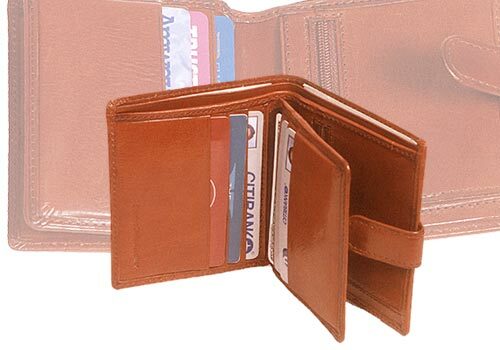 On opening, there are two note compartments and two side pockets. The RHS has a zip pocket for coins. The flap on the LHS can hold 3 credit cards on each side. There are three more credit card slots beneath the flap. The colours available are Black, Brown, and Burgundy & Blue.